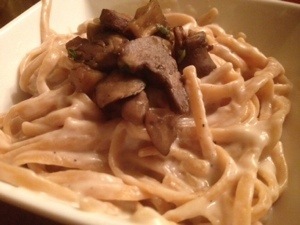 Looking for a great vegan Alfredo sauce? This cashew cream sauce is not only delicious but incredibly easy! The cream sauce can also be used as a base for cream based soups such as cream of broccoli. 2. Melt butter in saucepan over medium high heat. Pour cashew sauce into sauce pan. Add 1.5 cups non-dairy milk to blender. Swish around to get remaining sauce. Add to saucepan. 3. Cook over medium high hear stirring consistently to avoid lumping. Cook until desired consistency. 4. Mix sauce with cooked noodles and add your favorite veggies such as sautéed mushrooms, sliced bell peppers, green peas, spinach, broccoli, or all of he above!